Into Eternity by Magic Hour Films, a trans-Nordic production, 75 minutes. For all the tragic and mind-boggling downsides to the recent Fukushima nuclear disaster in Japan, one silver lining emerges from that dark cloud: At least we’re talking with some degree of seriousness about the substantial dangers in so-called “clean” nuclear energy. 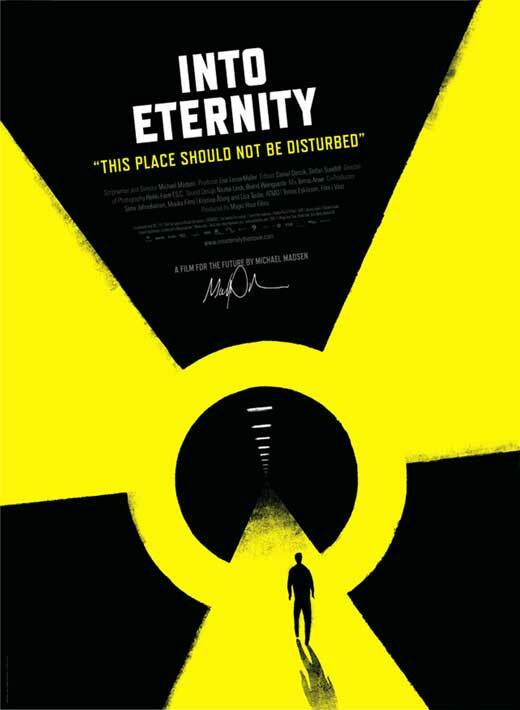 A recent film out of Finland, Into Eternity by Danish director Michael Madsen (not to be confused with the American actor of the same name), explores those dangers in a quiet but persistent meditation on just how unclean nuclear really is and just how long it will linger in our world as a reminder of this toxic — and some might say immoral — energy source. The documentary tells the story of the Onkolo Waste Repository, the world’s first permanent nuclear-waste storage facility. As the film’s title suggests, Onkalo is built to last into eternity. The reason? That’s how long the joys of nuclear waste, in all its cancer-causing splendor, and in all its harmful gene-mutating diversity, lasts. It’s because of the staggering time period in which nuclear waste continues to leave its unforgiving calling card that nations have had to wrestle with how to deal with the “spent” fuel rods — the waste material, which is still dangerous for tens of thousands of years or longer — resulting from choosing nuclear power. Too many governments, led by Washington, have shown gutless leadership in this regard, leaving spent fuel rods in open pools for their 100,000-year cooling off period. This is a “solution” with myriad problems, from the energy required to cool such pools to the national security issues that an impermanent strategy invites. Only Finland has gone the distance, deciding in 1994 to amend the Finnish Nuclear Energy Act to require that all nuclear waste resulting from Finnish nuclear production be stored in Finland. To make a long story short, thus was born Onkalo. But the story really can’t be shortened too much. The reality is that Onkalo, a storage site that the film explains was painstakingly chosen from among many options, is 1,710 feet underground, built into solid bedrock in a process that is taking years to complete, blast by daily blast. Ultimately the facility is designed to hold 100 years worth of used fuel rods, meaning it wont technically be completed until the 22nd century, when it was finally sealed up after the last waste rod was deposited. There’s your backstory on Onkalo. What the film does, and brilliantly I might add, is tell the story with a characteristically Nordic temperament — methodical, unrepentant, quietly insistent, with a gravity foreign to the US social, political and cultural scene. Between its deadpan seriousness and the film’s oddly luscious visual and graphic styling, the film could have been directed by Swedish darling Ingmar Bergman. But in spite of the grave subject matter, this beautifully filmed journey deep underground and far into eternity is truly a delight to watch. This may be because after years of living under the clownish US cultural milieu (as James Howard Kunstler might put it), it’s a welcome breath of fresh Nordic air to see and hear some truth. That truth is that nuclear waste is an unending nightmare and nuclear facilities are not any kind of clean-energy dream come true. From the mining of uranium and plutonium to the massive energy inputs required to build and maintain the facilities to living perched, like Three Mile Island, Chernobyl and Fukushima, one wave or switch or blast from certain disaster, nuclear power too easily boasts its “clean energy” cred without the substance to back it up. And as for how these plants get financed — privatize the profits and socialize the costs — not even the Tea Party Patriots are sucker enough to back these taxpayer behemoths. That, of course, is another story, but it’s one that could use a documentary of its own. Into Eternity moves slowly, but not in an “I’m-bored-where-are-the-nuclear-superheros-when-you-need-them” kind of slowly. Instead the lush shots of the wooded Finnish landscape above ground, the camera lingering on the sterile and yet oddly organic nuclear facility controls and industrial engineering, the variously gloomy and then magnetic lighting of interior and exterior pans and the clinical and yet emotive interviews with scientists and government officials related to Onkalo’s development, draw the viewer in to a soulful reflection on nuclear energy laid bare. It is, as I said, a kind of meditation, and one you’re not inclined to break for the fast cuts and montages that tell today’s stories for ADHD nation. See the trailer here. By taking a reflective approach, the filmmakers help explain just how difficult it is to not only store the spent rods, but also how vexing is it to think in terms of a hundred-thousand-year future, when Earth residents will inherit Onkalo’s troubled contents. Will we be able to effectively warn them from curiously reaching in to the tunnels and tombs holding 21st century toxic remnants? In just 3,000 years we barely understood the Egyptian pyramids, and our archaeologists were hungry to dig in to their perceived treasures which, while full of both metallic and historiographical gold, were, admittedly, their culture’s places of death. Will future generations be well enough cautioned against exploring Onkalo? Can it be hidden? And what if it is found and opened anyway? These moral conundrums clearly weight on the minds of Onkalo’s architects and workers, along with nuclear officials in Finland. But forget the future for a moment. Will the warnings from this film be enough to make people in all nations with nuclear power pause to reflect? Can we start to grow up on the energy front and begin taking responsibility for our energy use, its sources and its often-horrific pollution? Madsen’s documentary opens the door to dialogue. Finding ways to get this film shown can begin the conversation. It’s a perfect conversation starter for Transition groups, anti-nuclear activists and citizens who want a larger voice in energy choice. Produced in 2010 by Magic Hour Films with a bevy of support by various Nordic film institutes, the film opened in US theaters earlier this year. To buy a copy of the film for public screenings contact Films Transit International. I wish I would have written that intense review. Thanks for the heads up on the film. The quote that always sticks in my head, and I don’t even know where I got it, goes like this: “With wind power, things can go wrong. With nuclear power, things can go VERY wrong.” That’s without even considering the long term…and that was long before Fukushima. With unexpected surprises that added glamour to the First International Uranium Film Festival of Rio de Janeiro which ended Saturday night (28th of May 2011) in the historical Manson “Laurinda Santos Lobo”. The filmmakers and guests were treated to a feast of food and traditional drinks, like Cachaça Magnifica and Caiprinhas of Rio de Janeiro. From 34 international productions surrounding the nuclear fuel chain and radioactive risks four winners were selected. The best feature film – selected by the jury – was a new production by Director Michael Madsen from Denmark “Into Eternity”. An impressive film which deals with the philosophical questions of the issues concerning the permanent storage of high-level nuclear waste. The film brings the audience down thousands of meters into a rock formation in the countryside of Finland where the construction of the first high-level nuclear waste storage facility is been built. The best short film of this first International Uranium Film Festival – selected by the Jury – was a Costa Rican production of director Pablo Ortega of the University of Costa Rica: Uranio 238: La Bomba Sucia del Pentágono, Uranium 238: The Pentagon’s Dirty Pool. “In my 25 years as an anti-DU activist this experience has been a highlight in the exposure of a very serious problem that faces mankind today: The use of radioactive waste as a military weapon”, says Damacio A. Lopez, the executive director of the International Depleted Uranium Study Team (IDUST) who represented the film together with Isabel Macdonald from the San José Quaker Peace Centre of Costa Rica. The audience award for the best short film were given to: “Césio 137. O brilho da morte”, directed by Luiz Eduardo Jorge of Brazil. His documentary shows the events that transpired in a real live tragedy about the release of Caesium-137 into a populated area in 1987 in the city of Goiânia, Brazil. This was the worst radioactive accident in Latin America, which cost the lives of many people and the health of hundreds or possibly thousands of survivors. “Césio 137. O brilho da morte” was produced by Laura Pires as well as the winner of the audience award for the best movie: “Césio 137. O pesadelo de Goiânia”. Director Roberto Pires contracted famous Brazilian actors for this important and first ever made film of this nuclear accident in central Brazil. The script of “Césio 137. O pesadelo de Goiânia” is based on statements by the victims and medical personal attending the victims, taken by Roberto Pires at the time of the accident, who himself some years later died from radiation exposure. A big surprise for the invited guests was the appearance of three representatives of the indigenous peoples of Brazil who gave a musical performance and a prayer to the Uranium Film Festival and its guests. Chief Alfonso Apurina from the Amazon state Acre and his two companions from other indigenous peoples were invited by the festival organizers in respect of their traditional land rights to Brazil and in respect to their struggle to preserve the Old Indigenous Museum of Rio de Janeiro, that is in danger because of construction of projects to accommodate the 2014 FIFA World Cup and the Olympic Games. Filmmakers and producers are already invited to send their documentaries and movies! I’ve only just discovered that there is a type of nuclear reactor which can use “Spent” fuel, reducing the time scale of its radioactivity from millennia to about 300 years. The design was researched and prototyped in the US from 1958 to 1976. Development was abandoned because it was useless for the production of weapons-grade nuclear materials. Basically, there are two types of radioactive “waste” (I always try think in terms of reuse rather than waste, and the same should apply for nuclear). There are actinides, which have heavier atomic mass than uranium. And there are fission products, which have lighter atomic mass than uranium. Actinides are not found naturally on Earth. They are highly toxic and remain dangerously radioactive for tens of thousands of years. Fission products would be normal elements, but they have some extra neutrons. They decay into normal elements with background levels of radiation in about 300 years. To make a uranium atom split, it is bombarded with neutrons. It collects neutrons, increasing in atomic mass and becoming more unstable. Basically, it gets turned into an actinide. Eventually it splits into two bits called fission products, both of lighter atomic mass than uranium. If all the actinide atoms split into fission products, the “waste” problem would be 300 years rather than 100,000. However, the intense radiation in a reactor physically degrades the fuel rods and they have to be removed before they start falling to bits. But only a fraction of the energy has been used, and a load of the uranium has been converted into heavier actinides. The reactors that can fix this are molten salt reactors (MSRs). They don’t have fuel rods. Instead, uranium (or other heavy metal) is dissolved in fluorine salts at about 650 centigrade. That’s a moderate temperature (steel is cast at 1700 centigrade), and they aren’t pressurised so they can’t blow up. Fission products are removed continuously by a chemical process. The heavy actinide elements are just left to circulate until they break down into fission products. MSRs can eat just about anything. They can break down the waste from the stupid nuclear power stations that should never have been built, but they’ll mulch down the plutonium from the Cold War weapons just as effectively. And they can generate lots electricity at the same time. Producing no more waste is not good enough, we have to clean up the existing mess. I was utterly opposed to nuclear reactors until I found out about MSRs. That was only last month, and I’ve been investigating MSR safety as fast as I can since then. So far, they seem pretty safe to me, though I’m not an expert.